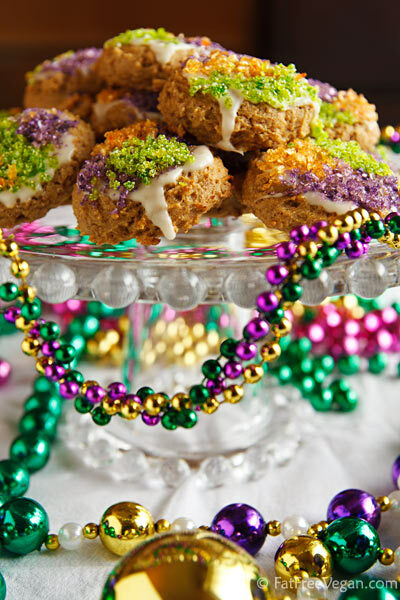 These cinnamon-pecan King Cake Cookies are made without gluten, oil, eggs, or dairy products and sprinkled with the colors of Mardi Gras. 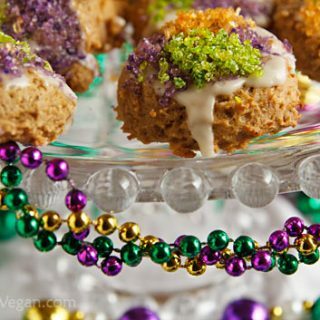 Mardi Gras season officially began on January 6, and though the parades don’t start to roll in New Orleans until mid-February, I already have Mardi Gras–or more specifically King Cake–on my mind. I haven’t had a piece of King Cake in years, but that doesn’t stop me from craving the sugar-laden, gaudy confection. Even more than the flavor, I miss the fun of sharing a king cake with friends. And, of course, the sprinkles! So when it was my turn to host my book group this past Monday, I decided to sprinkle a little Mardi Gras into the occasion by baking a batch of cinnamon and pecan cookies and giving them the purple, green, and gold treatment. Since one of our group members can’t eat gluten, I made them with two of the gluten-free flours I had in my pantry, but I’m sure that there are better blends that a more experienced gluten-free baker could come up with; feel free to use your own favorite combination. As you probably know, King Cake is served at parties during Mardi Gras, and hidden inside each cake is a plastic baby or a bean. The person who finds the baby is responsible for bringing the cake to the next party. Because I was worried that one of my friends might break a tooth if I put anything inside a cookie, I decided to skip that part of the tradition. But as my daughter E was helping me decorate the cookies, she came up with the idea of putting a raisin or a pecan half into one before baking. Genius! I wish I’d talked to her about it before I’d baked the cookies. A word about the sprinkles: I used food coloring to color raw sugar, which is tan, causing my sprinkles to be not quite the colors I wanted. But the large crystals do add an interesting crunch to the cake-like cookies, so if you’d like to color your own, just add a little food color to the sugar and mix it in with your fingers. 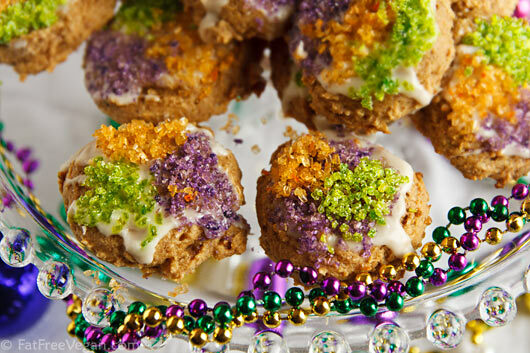 Don’t worry–the food color rinses off easily so you won’t have Mardi Gras fingers for long. Everyone in my book group seemed to like the cookies, though it was hard to tell how many they ate because E kept sneaking in and stealing them. She agreed with me that the gluten-free flours gave them a slightly grassy taste that we’re not used to, but she liked them enough to give them 4 out of 5 crumbs on her Num-Crumb Scale™. Real King Cake is yeast-raised, more like a giant, round cinnamon roll than a regular cake, and though these cookies are cake-like, they’re really only similar to King Cake in spirit (and color scheme). If you’re interested in making the real thing, check out Kittee’s Vegan King Cake, which looks downright delicious. If you’re not following a gluten-free diet, you can make these with wheat flour (unbleached or whole wheat) by using 1 cup of flour and omitting the xanthan gum. Adjust the water as necessary to get a thick dough. Preheat oven to 375F. Process the pecans in a food processor until finely chopped but not powdered. Remove crushed pecans to a bowl and add the tofu to the processor. Process until almost smooth. Mix the pecans, flours, xanthan gum, baking soda, salt, cinnamon, and sugar in a mixing bowl. Add the tofu and vanilla and begin to stir. Add water by the tablespoon until all the dry ingredients are incorporated and a heavy dough forms. Be careful not to add too much water. Use a cookie scoop or tablespoon to drop rounded tablespoons of dough at least two inches apart on a baking sheet lined with a silicone baking mat or parchment paper. Flatten each cookie slightly with a fork. Bake for 10-16 minutes or until edges are golden and middles seem done. Remove from oven and allow to cool for 5 minutes before transferring each cookie to a wire rack. Allow to cool before decorating. To decorate, put 1/2 cup of confectioners sugar in a bowl. Add a couple of drops of vanilla extract (be careful not to add too much or it may make your icing dark). Add water one teaspoon at a time, stirring well and stopping when you have a thick but spreadable icing. If it’s too runny, it will run right off the cookies, so if you add too much water, add more confectioners’ sugar. Spread the top of each cookie with icing and sprinkle immediately with each of the colored sugars. These are best eaten the same day. The longer they sit, the more moisture they attract, and the icing and sugar become less attractive, though just as edible. Makes about 21 cookies. Nutrition data is for 1 cookie. Maque Choux on What Do I Know? 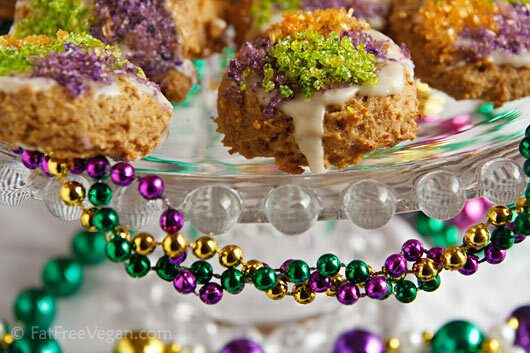 I love your King Cake cookie idea! This year, I will try to replace the dyed sugar with flavor-infused sugar, which acquires a color of the flavor though not as jewel-toned. Hi! I really want to make this recipe- but among the friends I am hoping to share with, one of them is also soy free… so I can’t use the tofu- we are not vegan tho- so could I substitute eggs? Or maybe banana or applesauce? Eggs would probably be closest to tofu, but I really have no experience in cooking with them, so I can’t say for sure. I ended up using 2 eggs and one banana for the tofu-ended up adding about double the amount of flour and no water due to the added moisture from the eggs. The cookies came out good. Hi there…On top of no gluten, egg, or dairy, I’m also soy free…any suggestions on what to use in place of the tofu? Thanks! I’ve seen cookies made with beans, so I’ll bet you could substitute mashed white beans for the tofu. I haven’t tried it, though. Thank for sharing your recipies with us , you don’t know how many peaple you heal of their illness. God bless your talents. Any chance you’ve developed a WFPB fat-free King Cake recipe by now (It doesn’t have to be gluten-free)? The recipe you linked to on Kitee’s website has 8 tbls of fat in it. I live in Lafayette LA and would love to be able to make one this season. That’s a great idea! I may give it a try.